We buy & sell farm land, commercial and residential properties and rentals. Serving Shelby, Spencer, Oldham & Other Kentucky Counties! We are pleased to offer some of the most beautiful Kentucky farm land that you will find anywhere. In addition to farms and farm land, we also have residential and commercial properties and rentals. Whether you're looking to purchase a 300+ acre farm with a beautiful southern home or rent a two (2) bedroom condo, we have a variety of properties to meet your needs! Look at all our properties listed on this site and check out our links page to find out more about the area and other services. 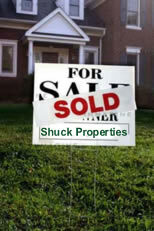 If you have any questions, please feel free to contact Shuck Properties or call us at 502-633-1300.